Frightening? Don’t worry. We have your back. Oropharyngeal exercises were shown to reduce snoring and mild to moderate obstructive sleep apnea. The results of a randomized trial published in the American College of Chest Physicians by Vanessa Leto, et. al. showed that patient that performed a series of exercises 3 x/day for 8 minute over a period of 3 months demonstrated a significant decrease in the frequency of snoring by 36% and the power of snoring by 59%. Some of the exercises are as simple as pressing the tongue tip against the hard palate and sliding it back and forth 20 times. Regular didgeridoo playing is also an effective treatment for patients with moderate obstructive sleep apnea syndrome. 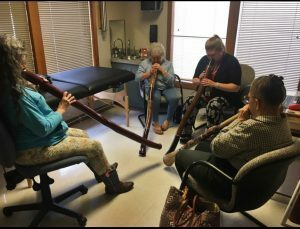 At Southwest Rehabilitation, our Didgeridoo Club meets bi-weekly to play the didgeridoo. Never played before? Not to worry. We provide instruments and lessons to anyone interested. Come to our Didgeridoo Club meetings held at 2085 Inland Drive, Suite A in North Bend and learn about sleep apnea and possible treatment options for mild to moderate obstructive sleep apnea. Visit us on Facebook to find out dates and times.